As usual, Europe is well-represented in the 2015 Grade 1 Arlington Million. Five of the 13 entrants in Saturday's 33rd running made their last start overseas, though they are far from the most imposing bunch ever to land on our shores for a major race, none of the five having tasted success at the Group 1 level. The most fancied of the Europeans is the 8/1 ML #11 Maverick Wave, which is not exactly a ringing endorsement of the shippers in this race. 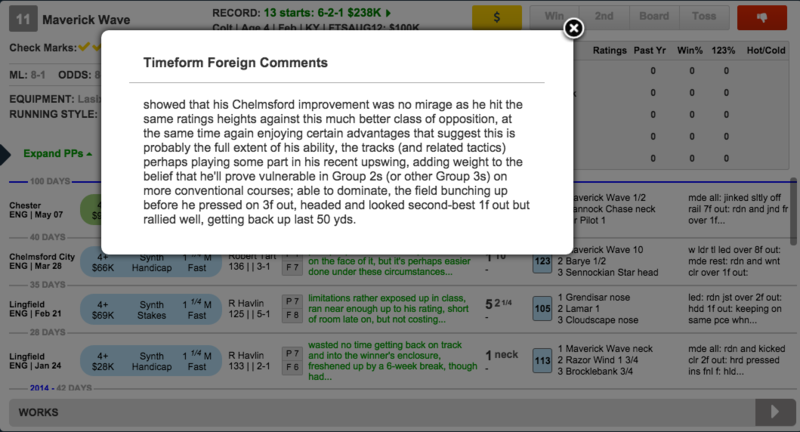 As our Timeform colleagues in London make clear in their analysis of his recent races, he has taken advantage of highly favorable circumstances in posting back-to-back wins recently, and he is one they thought would prove vulnerable in Group 2-or-3 company going forward. The American contingent is a solid one, and it is led, as usual for top turf races over here, by trainer Chad Brown and his pair of #2 Slumber and #4 Big Blue Kitten. 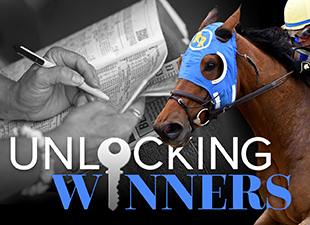 They recently completed the exacta in the Grade 1 United Nations, with the latter coming out on top. That marked the third Grade 1 success for Big Blue Kitten, who has become one of the most reliable older turf horses in this country over the past few years. He is a strong finisher, and his connections have recently taken to employing a rabbit for him, as they will again in this race, with #9 Shining Copper entered to ensure some pace. Slumber had proven to be a disappointment since arriving from Europe at the end of 2011, but he has enjoyed a career resurgence since Brown took over his training at the end of last year. He finally broke through with a major win in the Grade 1 Manhattan on Belmont Stakes Day in NY, and he outfinished Big Blue Kitten that day. He wound up behind his stablemate in the U. N., but Slumber was held up behind horses and had to steady at a crucial point in that race, and he came with a strong finish once able to alter clear in the stretch. We think he is going as well as he ever has at this point, and we prefer him of the two Chad Brown entrants. The other horse we want to use is #10 Triple Threat. A horse of some quality prior to arriving from Europe, he made his stateside debut for Bill Mott in Grade 2 company at Monmouth Park back in early June. Triple Threat was up against it while last behind a slow pace (note Pace figures/fractions shaded blue) in that spot, but he came with a strong finish after swinging out to the clear to close that race down. That was an impressive performance, and he will have a better set up here, due to the presence of Big Blue Kitten's rabbit. The Play: We'll take Slumber on top in the Arlington Million, and try to get Triple Threat involved underneath. 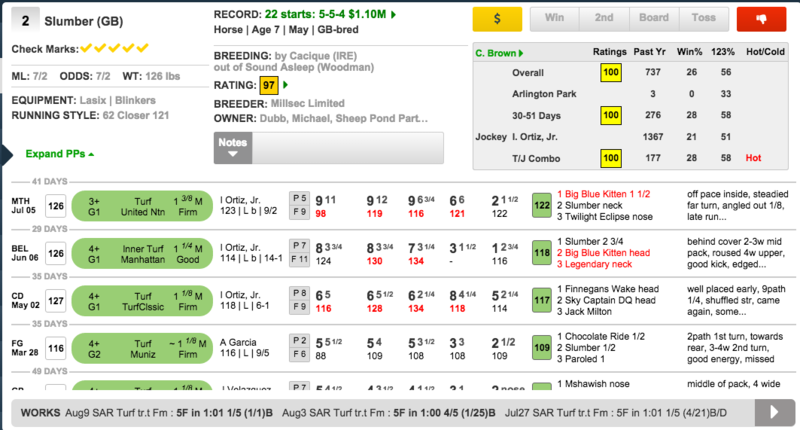 We will focus on those two horses in multi-race wagers, while using Big Blue Kitten defensively.